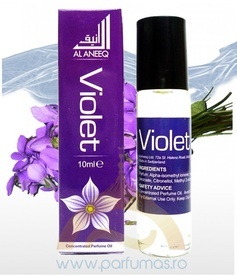 Parfum feminin fresh floral cu note intense de violete. "Violet" este un parfum concentrat pe baza de ulei, de inalta calitate, nu contine alcool si confera persistenta indelungata.Sticla este prevazuta cu sistem roll-on pentru aplicarea cat mai usoara a parfumului. You will be pleasantly surprised by this scent. It doesn't have an overpowering fragrance like many florals. This is a very green floral. It has a dry, earthy note to it, very much an alpha ionone note, not sweet at all. Very close to what you would smell when you inhale the fresh vibrant fragrance of violets growing on the window sill. This fantastic perfume oil is high quality, long lasting and is free from ethyl alcohol, a little of this exquisite fragrance goes a long way.